out the Demons think they must have the wrong place and just keep flying on to Lombok, Java or or even to Sydney's Manly Beach. 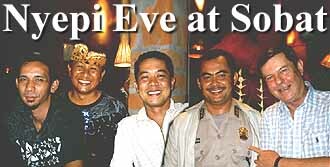 Although Nyepi is a national holiday, the blackout is only observed in Bali. Many ex-pats leave Bali to avoid Nyepi, some even check into a Bali International hotel, where they can be relatively free inside the grounds, to eat in the cafe and swim in the pool. Special wardens pecalang from each village Bunja (village council), dressed in black, patrol the streets to make sure the blackout is enforced. The festival is the most unusual of all the Balinese religious days as the entire island comes to a complete stand still after an evening of revelry where Papier-mâché Ogoh-ogoh's are paraded through the streets, then taken to the beach and burnt. 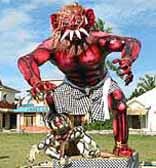 The Balinese believe the Ogoh-Ogoh's attract the demons, who follow them to the beach. Burning the Ogoh-Ogoh's rids the island of demons. The village youth spend the month before Nyepi making thems, competition to construct the most evil and fearsome Ogoh-Ogoh is intense. Friday March 31, the post Nyepi kissing festival was held in Denpasar. Any boy is allowed to kiss any girl he wishes. This year over 300 participated, with another 2000 watching. The ritual is meant to ward off unexpected dangers. Ogoh-Ogoh processions and watch the Batu Belig festivities. At Warung Sobat we were joined by friends Henri and Rio from Java. the demons. In Pak Made's village of Batu Belig their painstakingly made Ogoh-Ogoh was carried to the beach, with hundreds of Balinese and Ines following. After all the fun we settled down for dinner at Warung Sobat, where we all discussed how we would spend the day of silence. Rob and Win planned to have a relaxing day with their family. Ines planned to watch lots of martial art videos. When we departed Warung Sobat, Pak Made gave us a huge Balinese roast chicken. Shortly after we returning home, Wiwin's sister arrived with a huge dish of Soto Gambing (Goat Curry), talk about a feast day. Friend Rio spent the day with us, he is an artist and helped Jamal with his latest work. After a sumptuous dinner and a bottle of Hatten's best red, we settled down in our blacked out room to watch The Sound of Music for the 900th time followed by a Guns n' Roses concert video. Long-time friend of John's, Ian of Bendigo celebrated his 50th birthday on April 1. A party in his honour was held at their home. John and Jamal were invited but unfortunately able to attend, however we phoned during the party to offer our best wishes. 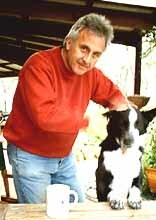 Ian was the first ever employee at John's film production business in the 1970's, Ian was only 17 at the time. John and Ian have remained friends ever since - How time flies. The AirAsia book-on-line ticket cost A$31 + $6.71. for the train to Bandung. The 26hr, 1000km bus costs A$52. Plane/train +/- 6 hours. assistant Madame VeVin has been running all over Bali to find bakers yeast, gluten and real imported flour. Mdm VeVin says M. Wobert keeps screaming "Je veux faire le pain." Madame VeVin always agrees and says "Monsieur Wobert, you are, vreally, wery, big pain." Monsieur Wobert presented the KHO with one of his loafs-delicious!. Bali old-hands Leo and Erna arrive in Bali each November from Holland and stay in their villa in Batu Belig, just up the road from Warung Sobat, for the European winter. While they were in Bali this year they sold their old Suzuki and bought themselves a new car. Bangkok and all points west, we attended a farewell dinner in Warung Sobat with the compliments of owner Pak Made. routes and compete with MAS on the other 19, giving passengers the option of choosing a full-service or a low-cost carrier. Australia's Qantas subsidiary Jetstar International discount airline will begin overseas flights from Melbourne this autumn. Destinations will include leisure spots such as Bali and Phuket, Ho Chi Minh City and some Pacific areas, the Melbourne Herald Sun said Wednesday. By 2011, JetStar plans to add North American and European destinations to its schedule, using Boeing 787 aircraft recently ordered by parent Qantas. Indonesia prefers Russia's Mi-17 helicopters for modernizing the Asian nation's chopper fleet and plans to spend $200 million buying the aircraft. The news means a loss for Boeing Co.`s Chinook helicopter, which Indonesian military personnel had been considering. The preference for Mi-17 aircraft may have been helped by the Kremlin`s willingness to loan $1 billion to Indonesia at a very favourable rate. 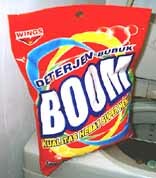 A new low cost washing detergent called BOOM has been recently released in Bali by PT Wings Surya company of Surabaya, Java. The 800gm pak costs only Rp 4,950 (A77 cents) that is very cheap compared to the international brands which usually sell for around Rp 14,000 (A$2.10) for 1kg. Jamal has been using BOOM in the washing machine for 2 weeks, he says it is just as good as the other expensive brands. At the KHO we decided to get the KHO laboratory to run an extensive test on BOOM, we were surprised at the result. We took two sets of soiled white towels, washed the first set in an expensive international brand, Brand X, then on the same cycle, with exactly the same amount of BOOM we washed the second set. We tested for whiteness on our antique reproduction Edison Fluoroscope to find the reflected white spectrum was exactly the same on both products. We couldn't pick the difference, BOOM washed just as good as the other overpriced Brand X. BOOM is available at Alpha Supermarket and selected mini-markets in Bali. The staff presented Ines with a special Low-Cal cake and sang Happy Birthday. Tuna, Steak or Ribs. After we adjourned to the courtyard for a cream desert and coffee. Everyone had a great time. Thanks Ines. indictor lock. John purchased the lock at Nevil's Junk Yard, along with friend Ian (right) in Bendigo, Australia during his recent visit. In Bali rain has continued through March. Even now we have rain and storms from tropical cyclone Glenda off Australia's NW coast. Rainy season normally begins late Nov or early Dec and ends by late Feb. This year it started late Sep. This is the longest rainy season we have experienced in 9 years in Bali. The recovery of Bali tourism is still a long way off when one looks at the latest arrival figures. Arrivals in Bali for February 2006 hit 73,400 – a figure down 27% from the 100,600 visitors in February last year. January arrivals were down 21% We wait for the March figures to see if at last there is a turn around. Australians are staying away in droves, down 35% in February and down 34% in January. We hope for the Balinese sake there will be an upturn soon. Garuda Indonesia will increase its passenger capacity from Australia to Bali by almost a third from April, with growth from most major ports including Sydney, Melbourne, Adelaide and Perth. This is good news because seats have been scarce on the run since the demise of Air Paradise following the second Bali Bomb. The new Boeing 737 (new generation) type will operate from Perth. Garuda Airbus A330s will continue operate from Australia’s East Coast. Qantas are offering discounted tickets on-line to Bali from the Australian East Coast from A$751 The ex-Melbourne ticket is only for the Australian Airlines flight out on Saturdays and you must return on the flight arriving Friday. Terrorism is not deterring British tourists, with many feeling it is important to support stricken destinations with tourism, recent research has revealed. Two thirds of British adults said they would not give in to terrorism and let it keep them from visiting places that have suffered attacks, a survey from Mintel found. Nearly half (49%) said that they were becoming hardened to terrorist attacks and would not be as discouraged to travel as they would have been five years ago. As many as 55% thought that terrorist-hit destinations became quieter and therefore more attractive, while more than 30% would reconsider visiting, areas affected by terrorism if a discount was offered. The Bali International Cricket Club (BICC) is based in Sanur, Bali. squad travelled to Melbourne to play in an International Cricket Council event. All of these players have learnt the game through the Bali school’s cricket program. A team of former Australian Test and State cricketers will tour Bali in April to demonstrate Australia's support for the Balinese and to promote the game. Paul Wilson, David Fitzgerald and Richard Chee Quee. All greats from Australia's long cricket tradition. John's mum Nancy has sent this recipe in from her Gran's 90 year old recipe book which was always kept in the back of the family Bible. The Anzac Biscuit came about during the 1914-1918 First World War. The most popular story of the origin of the Anzac Biscuit is that they came about due to resourceful women on the "home front" wanting to make a treat for their loved ones that would survive the journey by post to the war front. Mix the hot water with the Bi-carbonate of Soda. Mix all the dry ingredients in a large bowl, then add the golden syrup and the hot water mixture and mix well. Roll biscuit size balls and place on a greased baking tray in rows. Bake at 120 Celsius (250F) until golden brown. Keep a close watch, Anzac biscuits burn easily. With Avian Bird Flu all around us, it is important to be careful with poultry and eggs, making sure they are cooked properly to avoid any risk of contracting the disease. contaminated eggs. When Avian Flu was discovered in Indonesia the KHO ceased making home made mayonnaise. However recently we discovered a solution - Pasteurize the eggs at home. 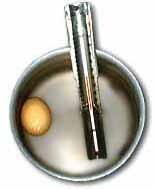 Take a large saucepan and fill with water, insert a thermometer and heat slowly to 65C (150F) As soon as the temperature reaches 65C (150F) turn off the gas. 71C (160F) and will be "scrambled eggs" at 82C (180F) - but if the temperature is maintained at 63C (145F), the result is a safe egg that will act like a raw egg for our home made mayonnaise recipe. He discovered that most infectious diseases are caused by germs. His work became the foundation for microbiology. Pasteur developed "pasteurization", a process by which harmful microbes in perishable food products are destroyed using heat without destroying the food or changing the taste. Before milk had to boiled to prevent the transmission of Tuberculosis from cows to humans. It tasted terrible. Beat egg or egg yolks with a rotary beater until slightly thick, add 1 teaspoon oil at a time beating well after each addition, until 1/3 cup has been added. Add a few drops lemon or vinegar. The mixture should be quite thick and perfectly smooth. If it isn't you added the oil too quick or didn't beat it enough. Continue to add the oil and acid alternately until it's used up. Add seasoning to taste. Last month we told of our trip to Thailand and Malaysia. We now continue with the final sector, KL to Melbourne via a very unusual route. December 15, 2005, however this was not convenient as I already had a 6 month visa and we had already booked our holiday at the end of the visa. I thought as we would already be in Malaysia, maybe I could get back to Australia from there. Early last December Tiger Airways jointly owned by Singapore Airlines and the Ryan Air family announced they would fly to Darwin for S$30. I checked on-line, all the $30 tickets had gone but I got one for A$75 + taxes. Very cheap, Qantas charge A$1050 for the same sector. First leg was to get to Singapore from Kuala Lumpur. I travelled with Transnasional Intercity Bus. 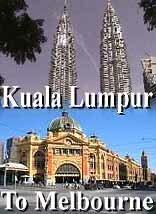 The trip takes 5 hours including transiting Malaysian and Singapore Immigration. The bus was very clean, the driver competent and we arrived on time. Cost was A$10.71. it takes almost the same time and is a fifth of the price. Air Asia offer a greatly discounted Kuala Lumpur - Jahore Baru fare, however you still have to transit immigration and enter Singapore by bus, this entire journey takes far longer than the Transnasional intercity bus. Support Services. Transnasional is the largest leading transportation operator in Malaysia, carrying more than 60M PAX per year and has more than 1,000 coaches. I spent the night in Singapore at Hotel 81 Gold in Geylang, 10 mins. from downtown by SMRT train. Hotel 81 is Singapore’s largest tourist class budget hotel chain, with 19 hotels and 2000 rooms. Located all over Singapore, they offer Singapore hospitality at very reasonable rates. Singapore doing a cooking course. demolished so many historical buildings from Colonial times. Next it was out to the airport, 20 minutes by A$1.20 by SMRT train and wait for our flight with Tiger Airways to Darwin, Australia. breakfast and drinks were available for sale at reasonable prices. We departed and arrived on time. Tiger Airways is based at Singapore's Changi Airport and first took to the air in Sep 2004 with the inaugural flight between Singapore and Bangkok it flies to 16 cities in 8 countries and has four Airbus A320 aircraft. In Darwin I spent the day with friends Pete and Liz. Pete met my flight at 05:00. I returned to their house for breakfast and a nap. Peter woke me up around 10am and very kindly took me on a complete tour of Darwin. First stop Darwin Aviation Heritage Museum. early pioneers and record breakers through WWII and the jet age. The major display item is a massive B-52 bomber on permanent loan from the US Air Force and is one of only two on public display in the world outside the USA. 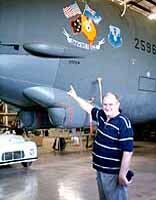 The B-52 is enormous, it is impossible to take a photo of the complete aircraft in the hanger. way for the Boeing 707, the first successful commercial jet airliner. The Boeing B-52 Stratofortress entered service in 1955. It has a speed of 1000km/hour, crew of 5 and has a range of 14,200km. The aircraft can carry up to 31,500kg of bombs. The aircraft has a design life of 95 years and is expected to continue in service until at least 2050. The aircraft is powered by 8 Pratt & Whitney TF33s (total thrust 17,000 lbs). The last aircraft was built in 1962. 744 aircraft were built, the price back then was US$74 million each. The cost of building one now would be far more, the reason for keeping the aircraft flying, currently there are 74 aircraft on active service. Recently Boeing suggested re-engining the aircraft with 4 modern jet engines, cost of US$34 M/aircraft. The US Airforce decided to stick with the old engines. After all USAF is not really concerned about fuel cost. DH-82 Tiger Moth, Supermarine Spitfire Mk VIII Replica, Huey Cobra AH-1G Helecopter and a B-25 Mitchell Bomber. The DeHavilland DH 104 Dove, a short haul (1,700km) 8 PAX aircraft. First flew 1945, 528 were built. The Spitfire was credited with winning the Battle of Britain and once held the world altitude record of 50,000ft. Over 20,000 were built. Pete then took me on to the East Point Military Museum with it's huge guns to guard Darwin in WW2, the guns were useless as the Japanese attacked Darwin by air. The large concrete structures at East Point were built to house two large guns. Construction was disrupted when Japan raided Darwin in 1942. The guns were finally finished in 1945 by which time the war was over. 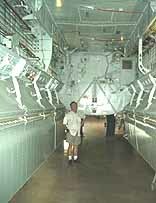 The guns which cost $200,000 to build and install were ironically sold off to the Japanese for scrap in 1960. Since, a wooden replica has been built. Inside the old fort there is a huge mechanical computer for calculating pitch height and range for the huge Darwin guns. Darwin was bombed 64 times during WW II. The museum has a film running of the bombings. In the surrounding area are a number of war equipment displays. Pete then took me to the very popular Trailer Boat Club for lunch. After a relaxing lunch and lots of coffee to keep me awake we visited the adjacent Museum and Art Gallery of the Northern Territory. 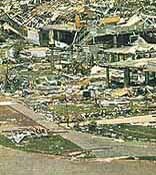 A "don't miss" is the Cyclone Tracy display depicting the devastation of the 1974 cyclone that killed 50 people and destroyed much of Darwin City. The first recorded cyclone to hit Darwin was in 1867. They also have a completely blacked out room with a massive sound system that plays a continuous actual recording of the sounds of cyclone Tracy. The display features many graphic photographs of the devastation. 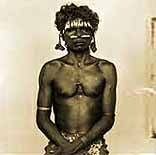 remarkable series of Aboriginal portraits taken in the 1870's document the Larrakia and Woolna communities of Darwin. Foelsche's townscapes and landscape images show life in colonial times. by Paul Foelsche's, he was a key broker between his Larrakia people and the South Australian colonists photographed in 1890 aged 34. Paul Foelsche made his own glass plate negatives and printing paper from a concoction of egg whites. The collection was only found recently and restored by the South Australian Museum, Adelaide. Pete took me from one end of Darwin to the other and further, I'm sure if I stayed a week I would not have seen any more than I did in just that one day. I had not been to Darwin for 20 years, I could not believe what a clean, modern, sophisticated and cosmopolitan city Darwin has become. We visited the Darwin Waterfront Redevelopment Project, a $600M project by the Northern Territory Government. The development covers 25 Hectares. 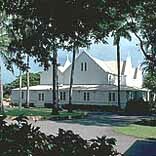 The old Government House was one of the few buildings that survived Cyclone Tracy. All houses in Darwin are now build to stringent anticyclone specifications. One old style house had been erected for posterity in one of Darwin's city gardens. Pete explained to me how land and house prices have skyrocketed in recent times especially on the waterfront. Darwin has a population of 109,478 (June 2004) and growing. The Australian Federal Government offer tax incentives for people to re-locate to Darwin. I was exhausted by the time we returned to Pete and Liz's house. Liz had kindly washed my shirt and socks, time for a 1 hour nap, then cocktails, before they took me to the Thai Hanuman Restaurant in Mitchell Street, in the city centre. 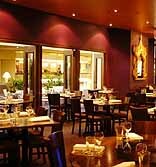 The cuisine at Hanuman consists of Thai, Nonya and Tandoori. All are of traditional recipes, married with premium local produce and match with fine Australian wine. Among the entrees are Chef/Owner Jimmy Shu's signature dishes including Hanuman Krachai Prawns, tossed in a delicate curry sauce with coconut and ginger. Wild Barramundi fish grilled and served with a ginger, tamarind and passion fruit sauce. Stir Fried Seafood, pan tossed with vibrantly hot basil and green peppercorns. Tandoori Prawns seasoned with cardamons, cumin and yoghurt. Murgh Makhani velvet butter chicken simmered in a rich cumin scented butter, cashew and tomato curry with coriander. Entree's cost around A$11, mains start from A$18. I was particularly impressed with the Hanuman Oysters with lemongrass, served in a ceramic pot with a decorative lid. After a wonderful dinner and my first Australian wine for months it was time to go to the airport and check-in for my Virgin Blue flight to Melbourne via Brisbane. I am indebted to Pete and Liz for their wonderful hospitality during my 17 hour stay. The two great restaurants, and special thanks to Pete who tirelessly drove me to every corner of Darwin. Darwin Airport is a nice little airport 15 km from the city centre, a pleasant change from the mammoth airports in large cities. From the car park to check-in is only a short walk. The departure lounge is compact with food outlets, fashion gift store, newsagent, duty free and a comfortable outdoor smoking room. The Darwin terminal has three aerobridges, shared by both domestic and International. The next and final two legs Darwin- Brisbane- Melbourne, on my epic journey were with Virgin Blue. I booked on-line months before my departure and got the flight from Darwin to Melb. for A$199. time at 1:30am and arrived in Brisbane slightly ahead of schedule, this gave me time to run out of the terminal and have a quick fag, buy a breakfast roll at Burger King and get to the departure gate just in time for the last leg to Melbourne. This was the first time I had seen the new terminal at Brisbane airport and also the new airport city train which also runs down to the Gold Coast. . ..... When will Melbourne ever get a train to the airport? I arrived in Melbourne at 10:00 am, took the Skybus to the new Southern Cross Station at Spencer Street, only to find the Bourke and Collins Streets trams were out of action, due to the Commonwealth Games preparations. I lugged my baggage all the way to Swanston St and caught a tram out to my house in St Kilda, arriving just before midday. I couldn't believe it, I had finally made it to Melbourne. I immediately crashed and slept hours, after all I had, had no sleep for two nights. On my first day in Melbourne nephew Trenton dropped over with his daughter Alice, I couldn't believe how much she has grown. "Who in goodness is that?" Then it was off by tram and bus to visit friends Mandy, Ian and the boys in Bendigo 145km from Melb. The weather was incredibly hot so we had dinner outdoors under Ian's new garden spot light, along with Mark, who had dropped in. Back to Melbourne after a very pleasant 3 days, then off to mum Nancy's home town of Leongatha with cousin Simon and nephew Trenton. On the way, we stopped for lunch in the pub, at the seaside town of Kilcunder. John's home town of Leongatha is situated 130 km SE of Melbourne, heart of a rich, green and dairy, beef, lamb, vegetable and wine growing district. I stayed with Nancy and brother Ross for a few days, we celebrated Ross' 52nd birthday at a dinner with his family and Nancy at the local RSL club. I returned again the following week for a further two days. Nancy is well and planning to visit Bali again later in the year. In Melbourne the usual rounds of dinners, catching up with old friends and family, sadly never enough time to see everyone. Joe and Jan at the "The Greek"
at 8.40am Sat. morning, requiring a 6.40am check-in. Cousin Simon (right) kindly took me to the airport. The flight departed on time and arrived in Bali 10 minutes early. The AA cabin crew appeared to me, no different to a Qantas cabin crew. The service was the usual QF standard and polite. The aircraft was only about 30% full and I had a window row to myself. No water or juice was offered before take off and the in-flight movie screen was so dull it was impossible to watch. uniform depressing, especially for a so called "Leisure Airline." To me the uniforms would be more suitable in a funeral parlour. Australian Airlines is a low-cost airline based in Australia, servicing Australian and Asian destinations. It is an all economy, full service leisure carrier and a wholly owned subsidiary of Qantas Airways. The airline was established in 2001 and started operations on 27 Oct. 2002. Qantas Limited has announced that after the launch of Jet Star International, Australian Airlines will be absorbed into the new carrier. The Australian Airlines fleet consists of 5 Ex-Qantas Boeing 767-338ER aircraft. configured all economy 2x3x2 with 271 seats. Sat Mar 4, I arrived back in Bali, and was met at the airport by Jamal and Dede. Time now to settle down for another six months after travelling continuously for 6 weeks, through 5 countries, by plane, train and bus, over 16,799 kilometres. Our next trip is planned for the end of August, we plan to visit Kuching, Sarawak in Malaysian Borneo.